In order to complete the challenge, I need a wrap-up post, so here it is. I enjoyed this challenge and am definitely doing it again. It helps get me out of the U.S. and England where 95% of my reading seems to be. I joined late in the year so that’s why some of my books are a little on the short side. I’m going to need a while longer to get through Ulysses. And My Name is Red, which I’m completely bogged down in. It is not speaking to me. In fact, I find it a real chore. I have no idea if I’ll keep going, if at some point I’ll get into it, or it will lay in the ash heap of unloved lit. It started off pretty well, with the body in the bottom of the well explaining how he was murdered. Now we need to find out by whom, but it’s sooo sloow. I think the best character is probably Esther the letter carrier. Everyone else is tedious. The book like a bunch I’ve read lately has numerous narrators (Moonstone, Luminaries, Ulysses), but goes further by switching off not just among people, but among things, like a coin, and Death. This is somewhat entertaining and yet, also seems to be more a device than helpful. I’m not sure if the coin or the drawing of the tree had anything useful to say. Then again, it’s taking me so long to read, if they did I’ll have forgotten before it’s relevant. The thing, too, about all these challenges, except the European Reading one, is they last the length of the year. Books started last year don’t count, so finishing it (and others) has to be in spare time left over from reading all the 2014 books. This is a drawback, but not enough of one because I think these challenges have me reading more and reading more interesting stuff. Yes, there’s still a lot of cozy mysteries, but mixed in with those have been Graham Greene, Evelyn Waugh, and Ernest Hemingway. Thanks, Rose City Reader, for hosting this challenge in 2013 and 2014! Looking forward to more European Reading this year. I am doing very well this week, reading-wise. Holidays and snow days help with this. I finished Ernest Hemingway’s A Moveable Feast last night. Short, easy reads help, too. I picked this for Jazz Age January having bogged down in Everybody Was So Young. I can’t link this yet because it’s after the 18th, but not yet the 25th. But I know me. I’ll forget. At any rate I enjoyed Hemingway’s Paris memories, especially the ones of his fellow writers and Sylvia Beach, although it does seem like the man ought to have had more of them. But then he was at the end of his life and tether when he wrote this and we’re probably lucky to have it at all. I read the original 1964 edition, though in outlining the editorial foofaraw it says “There is Never Any End to Paris” has been re-added, though it’s in my copy. It’s the last chapter. There is no chapter called “Nada y Pues Nada.” I definitely read about the Pilot Fish and the Rich, which was too vague to be interesting, but while it may have been shortened was certainly not unpublished. I’m darned confused, but not interested enough to buy the new edition and compare or find out if there was a different early edition than the one I’ve got. Must’ve been somewhat difficult for his last wife Mary to have read how fabulous things were with Hadley and a credit to her she published them as they were. So, thinking it would be interesting to juxtapose that with the Hadley-centric Paris Wife or Paris Never Ends, I debated. Novels usually easier. Non-fiction, truer. Was comparing and contrasting reviews and then opted for Careless People instead. I almost never read stuff hot off the presses, so to speak, but I’ve got it and the steam is still coming off the digits. I really do need to get a grip, book-buying-wise. But is that what Scott and Zelda would do? Never! P.S. Forgot to mention if you’re into Jazz Age Stuff: The Cat’s Meow is a very good movie with Kirsten Dunst as the gorgeous Marion Davies on Hearst’s yacht with all her Hollywood pals wearing gorgeous clothes and covering up the cause of death of Thomas Ince. A semi-true story as they say on imdb. So, still light and airy verse-wise, but not a lot going on. Tatyana is introduced and Onegin likes her. She falls for him WHOMP! and writes a letter having met him once. He’s oddly sensible and tells her he’s a bad idea and would only make her unhappy. This, of course, does nothing to dissuade her. And there we are. I have very little impression of either Tatyana or Olga, though a bit more of Tatyana, who seems to have spent her short life mooning about. It seemed like not enough happened for two books, but there it is. The nurse reminded me of Romeo and Juliet. And Ulysses No-Longer-a-Read-a-long: Having given myself permission to stop at the end of the Cyclops chapter, I did not. I ordered several books of interpretation so I could maybe figure out what I’m missing. Presume I’m missing a lot. 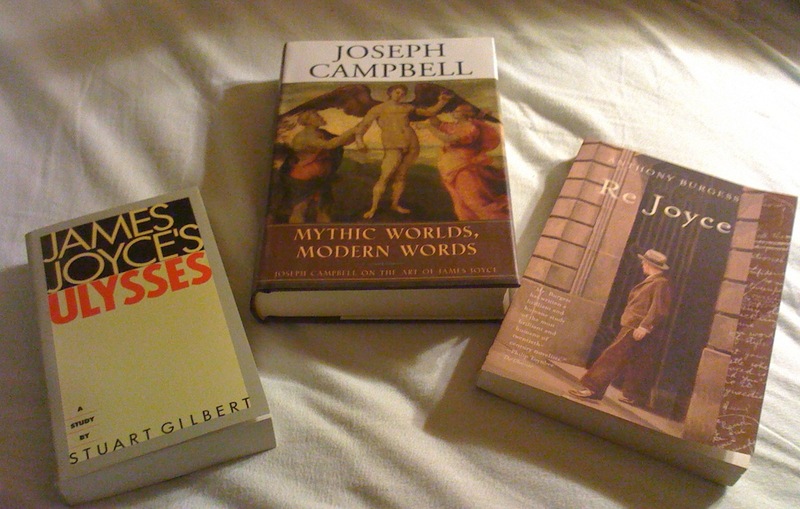 I bought Stuart Glbert, Anthony Burgess’ Re Joyce and Joseph Campbell’s Mythic Worlds, Modern Worlds in a fit of Joyce Will Not Defeat Me obstreperousness. Now I’ve got ’em, I don’t know if I’ll read them. If only I read faster or had more hours in the day. All of these are going to take a lot of time. At any rate, while waiting for these I started the Nausicaa chapter and was enjoying it, so perhaps it’s just that the Cyclops chapter wasn’t all that interesting. I found the parodies dull for the most part, the anti-Semitism disturbing and sudden appearance of the anonymous narrator puzzling. Maybe one of these will shed some light. I really wonder a lot about the recommendation to read the simplest chapters first, moving on to the harder ones. I think the book is tough enough without the added confusion of removing what little framework there is: that is, a single day in Dublin. You certainly couldn’t read the Odyssey in some random order. But then I don’t think Ulysses has as much in common with the Odyssey as it likes to pretend. Then again, I’m probably missing it all. I can see the guy at the end of the book throwing I forget what at Bloom resembling Polyphemus throwing rocks as Odysseus taunts him and I can see the pub as a sort of cave. But really the parallels are pretty thin, I think. If there were world enough and time, I might try reading it this way just for the hell of it. It seems to me what little coherence the book has would be lost. The opening two chapters are not all that difficult, but (again acknowledging that I’m probably completely missing a whole lot) you wouldn’t read the first chapter where they have breakfast and you get some idea who Buck is and who Stephen Dedalus is until you’d already read 9 other chapters. Instead you would start with Father Conmee crossing town, Stephen Dedalus’ poor family, Blazes Boylan buying fruit… Nah. Starting with this would be madness. Once again I have shirked my greater reading responsibilities (though not completely) and read another cozy mystery. Ms. Agatha Christie was really very good at these. Body in the Library dates back to 1942 and is an early Miss Marple. I think her second full-length story. And I did not guess at all. Once again though I was asking some of the right questions. (‘Why did they do that?’ I thought. ‘They didn’t need to.’ But they did, which was a critical point.) In the end it all falls into place. I also enjoyed this episode of Marple. Damn, that show’s uneven. They stuck very close to the book until the end and I liked what they did differently. Plus I love Joanna Lumley. I could watch her in just about anything. And the clothes were great, the scenes were well done. Even in the worst episodes (Sittaford Mystery, anyone?) I love seeing old favorite actors, but when they get it right it’s so much better. Sunday was not a real strong finish reading-wise. I did finish two books during the Bout and that’s what I had hoped to do, though I hope this doesn’t indicate a year of copping out of longer, harder books and reading quick reads just to meet the goals. That would be wrong, wouldn’t it? This was also supposed to be the day I finished Ulysses! Ha! I knew that wouldn’t happen, but I had hoped to get further. It all started so well, but really I’m rather bored by this Cyclops section. They’re in a pub nattering and there are bits of mild amusement in the sections that are written like old Irish epic parodies, but not as much as I think Joyce thought there was. At least not to me. The whole thing seems to have stagnated. I actually started Bleak House on the 12th and unlike the first time (I must really not have been in the mood) got a good few chapters in and was entertained by Lady Dedlock, Esther and the Jellybys and even the Court of Chancery. Also greatly relieved to find my copy is 788 pages and not as one in Amazon was listed 990! I realize the books are the same length really, all the words the same and the one probably has larger type and smaller pages and maybe forewords and afterwords, but still that’s 200 pages. Which just shows what a silly unit of measure a page really is. But I’m liking it and hope to continue liking it. And in the end were close as brothers. Become good friends from sheer ennui. I have the Falen translation and, as you can see, he kept the unusual rhyme scheme which I believe I read somewhere Nabokov said couldn’t be done! Thank goodness he was wrong about that, because I think rhyming gives a whole different feeling than non-rhyming although perhaps as long as you keep the humor it doesn’t matter that much. I suppose to be sure I would need to read a non-rhyming translation, but let me get through the whole book first. I have too recently started off well in a book only to bog down in the middle, so I hope it keeps up like this. Having decided not to worry about Everybody Was So Young and finish up Utz, was a freeing move. Bout of Books – if you’re not going to make your goals, just change ’em. Read 96 pages of Utz and finished it. This counts for the Czech Republic for European Reading 2013 and my 3rd book of the year. Utz, by Bruce Chatwin, is an odd little book. He’s the last of a well-to-do, but not terribly distinguished Saxon family who at an early age falls in love with Meissen porcelain and becomes a collector. As he lives through World War II and the Soviet occupation, the whole center of his life becomes this collection. It opens with his funeral, which is pretty amusing, and then goes back to the beginning and takes you through his life. I enjoyed it, but I imagine some people would feel it was pointless. The characters are good and I think it does give some idea of what it would have been like to live during that time in Prague. The endless annoyances of petty bureaucrats and secret police would be incredibly wearying. I then made the mistake of watching Marple: By the Pricking of My Thumbs. The whole Marple series is incredibly uneven. On the one hand, some of them stay fairly close to the books and the stream of actors I haven’t seen for years is great. I almost didn’t recognize Tom Baker in Towards Zero. If you’re a Christie fan, you may have noticed neither of these is a Miss Marple novel. They’ve taken most of the non-Poirot, not Tommy & Tuppence novels and turned them into Marples by shoehorning her into the plot. In Towards Zero it works fairly well, they just switch her out for another character in the book, but By the Pricking of My Thumbs is a Tuppence novel and while it’s not a very good one, it seems unnatural for it to be Tuppence and Jane (Tommy isn’t much in the book or the show.) One problem with it is that Christie just wasn’t that good at suspense. (Much, much better at your country house mystery. She could stand those on their ear and make them sing. How’s that for awkward phrase?) However, Tommy and Tuppence were lovable from the get-go and one didn’t see enough of them. This plot needed some help as it didn’t exactly cry out to be made into a film, much packing and unpacking and driving around in country lanes and Tuppence really was plot-simple to an annoying degree, but it didn’t need the sort of help they gave it: Tuppence is a lush who can’t drive and has lost all her confidence. This is all wrong. No one should be recognizing Tuppence as a ‘fellow soak’ who then regains her lost confidence in a Hallmarky solving of a child’s murder. A histrionic group confession. A woman who walks around in her witch costume, but is never seen in the show again. The whole witch idea. The American troops stationed there. The pregnant girl who won’t marry the American G.I. she really loves because he won’t tell her what he was doing Saturday night. The premiere of Jane Eyre starring a local brat. All of it quite painfully stupid. There is actually a good idea in the book and they kept that at least, but the apparatus they built around it was dafter and more unnecessary than the original daft and unnecessary apparatus Christie built around it. It does seem I’m infinitely more capable of rabbiting on about shows I don’t like than books I do. Maybe this should be called Good Books and Bad Movies. Oh and then I decided to start Bleak House another book I attempted years ago and didn’t get past the first couple pages, like the Moonstone. Let’s hope I enjoy it as much as I enjoyed the Moonstone this time. Much better. Had my own mini readathon on a good day to stay inside and finished The Case is Closed. As a bonus, in a pile of books I found a second copy of The Case is Closed. One of these days I’ve got to get organized. 125 pages of that. Unfortunately I knew how it was done from about page 30 because Agatha Christie had written a story with the same device in the previous decade. Don’t know if Wentworth knew that and forgot it, never knew it, or stole it. Still had to read to the end to make sure. Also began Utz by Bruce Chatwin. I bought this because it was set in Prague, then didn’t read it. I was reminded by Susan Hill’s mention of Bruce Chatwin in Howard’s End is on the Landing. It’s a quick read, very short. Appropriate for the Mini Readathon I didn’t sign up for. It’s more than half over now, so I could say I’m having a mini mini readathon – if I stop reading book bloggers and actually read some books. It is another day good for staying inside. Warmer, but grey and rainy. So that was 56 pages of Utz yesterday/today. Not sure when I crossed the midnight mark.